With her vibrant use of colour and striking attention to detail, it's not hard to see why Penelope Gwen has amassed a large following of beauty lovers on Instagram. Whether she's creating PRIDE-inspired eyeshadow or gothic makeup looks, her designs are true pieces of art. A self-taught artist from Bristol, England, Penelope is renowned for her experimental approach to makeup. Capturing our imaginations with her exquisite looks and regularly challenging conventional notions of beauty, her unique style inspires tens of thousands of young women every day. Experienced in high fashion, theatrical makeup and special effects, her innovation and creativity has gained her over 227,000 followers on Instagram. Just a quick scroll through her feed highlights her love of bright colour combos. Her designs definitely push the boundaries, and her close up snaps show she isn't afraid to combine shades the rest of us are too scared to try. However, her bold experimentation and innovative ideas prove even clashing colours can look fabulous. Not everyone can get away with using red lipstick as eyeliner, but Penelope's daring techniques are what make her stand out. At its core, her Instagram profile is both flawless and audacious - she even uses an avocado to apply foundation during one of her food-inspired videos. Despite her elaborate makeup tutorials, Penelope isn't afraid to showcase her more simple and natural makeup looks too. Not every influencer can so effortlessly transition from Lisbeth Salander gothic makeup to natural pool-side beauty, but that's what you'll find on Penelope's very popular profile. One of her most signature styles is brushed up eyebrows with a natural complexion and elaborate eyeshadow. This includes applying eyeshadow under her eyes, with her most popular looks using autumn-enthused reds or '80s-inspired blues. She's not afraid of black eyeliner either, and her gothic tutorials often feature heavy black lid lacquer. 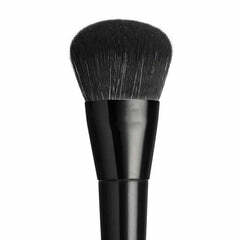 Shop Furless makeup brushes here.